A little more than a year ago, top surgeon Dr. Larry Bramlage stood up in Rood and Riddle's annual Client Education Seminar and issued a warning to attendees about a new group of drugs called bisphosphonates. Bramlage worried the drug was being misused, and that misuse was putting racehorses at serious, long-term risk of injury or delayed healing from injury. The response Bramlage got to that warning was overwhelming, and it came from both inside and outside the racing world. It continued as recently as this week: Several major consignors pledged on social media never to use bisphosphonates on sale horses, America's three major auction houses banned off-label use of the drugs, and the Mid-Atlantic region issued a prohibition banning bisphosphonates for horses under four, with the HBPA calling for a national ban. A year after Bramlage's declaration, there's a lot we still don't know about whether the drugs are actually contributing to increased injuries or slowing healing times. It isn't known how effective bisphosphonates may be against lameness conditions outside their FDA approval. Regulators are scrambling to find a practical testing process for bisphosphonates, and drug makers are struggling to keep the substance out of the hands of dubious practitioners and lay people. Bisphosphonates were approved for equine use about five years ago to treat horses with symptoms of navicular syndrome, a common, nagging foot pain in older horses. Before the drugs were approved for horses in the U.S., they were used in Europe and veterinarians could legally import them to treat American horses. Having them available to American practitioners who perhaps couldn't previously afford the import process has made a world of difference to mature horses dealing with navicular syndrome – and there are a lot of them. Roughly a third of chronic front leg lamenesses are believed to be related to navicular pain. Generally, bisphosphonates have been safe and effective in the population they're intended for. Bisphosphonates (sold commercially as Osphos and Tildren) are FDA-approved in horses four years old and up, and are not approved for use in mares who are pregnant or lactating. The reason for those restrictions is unanswered questions about potential side effects. Bisphosphonates do their work by reducing the action of cells called osteoclasts, which clear away damaged bone and make way for osteoblasts to lay down new bone. In a young equine skeleton, this could disrupt the growth cycle. Bramlage's 2018 warning was based on fears the drug may linger for a long period in the body, causing the creation of brittle bone that would fracture more easily, and this could also delay healing. One year later, Bramlage said he hasn't seen the increase in fractures he had feared, and he is also seeing fewer surgical patients experiencing slow healing. A forum discussion at the 2018 American Association of Equine Practitioners annual convention yielded mixed opinions on the drugs; some veterinarians said they'd seen no difference in their practice since the approval of bisphosphonates. Others indicated they were seeing an uptick in certain types of injuries. One Florida practitioner who requested anonymity recently told the Paulick Report a well-known vet group had seen a ten-fold increase in catastrophic breakdown and long bone stress fractures in 2-year-olds in training since the approval of bisphosphonates for use in horses. To that practitioner's knowledge, no other management or treatment practices have changed in that time. Many have questioned whether bisphosphonates could play a role in the recent spike in equine fatalities at Santa Anita. Bramlage told the Paulick Report he doubts this, since there would be no reason to expect Santa Anita's population would have been more exposed to the drugs than any other. But part of the problem is the lack of information about how many veterinarians are actually using bisphosphonates off-label in young horses, when they're using it, or how many doses horses are getting. “The problem is right now it's all anecdotal and there's lots of liability related to this,” said Dr. Jonathan McLellan, researcher and practitioner with Florida Equine Veterinary Associates. “If you asked lots of different vets, whether it's racetrack vets or yearling vets or training horse vets whether they use this product, I think lots of them would say, 'No we don't' and I don't know how believable that is. What can bisphosphonates be used for? It's common in the veterinary world to use a drug approved for use on one condition in one species on another species or another, related condition. This “off-label use” is legal because regulators recognize the barriers to new drug approvals are many and various. Most eye medications used in horses are actually human drugs, as are most antibiotics, heart medications, and some respiratory drugs. So it's no surprise that veterinarians have begun using bisphosphonates off-label to see what else they can do. For veterinarians using the drugs in older horses (which is appropriate, per its federally-approved label), the practice has already yielded some positive results in individual cases. Anecdotally, practitioners have had some success using the drugs to fight back pain and certain dental issues, but there is not yet enough information to be sure how effective they could be or how best to use them for those conditions. Bramlage said he has found bisphosphonates useful in retiring horses who are older and not going back to the track. “They can have somewhat arthritic fetlock joints and those horses when they transition to pasture activity, they generally adapt to that by stiffening their ankles,” he said. “They purposely increase the stiffness of the ankle so it reduces the motion in the fetlock joints. Then, they adapt and become perfectly comfortable as broodmares. We will get some horse that has bone pain from bruised cannon bones which is progressing to arthritis. You can help the horses make the transition by using bisphosphonates to reduce the pain at that site. In addition, there may be practitioners using the drug off-label outside of the approved age group. There seems to be two schools of thought on giving the drugs to young horses. One group of practitioners has tried harnessing bisphosphonates' action on bone to correct certain types of orthopedic problems common in sales yearlings and 2-year-olds. McLellan, with Florida Equine Veterinary Associates, performed a literature review ahead of the most recent AAEP annual convention, looking at bisphosphonates' potential impact on several common conditions. The literature review focused on stress remodeling, sesamoiditis, osteoarthritis, subchondral bone cysts, and palmar or plantar osteochondral disease. McLellan's findings were essentially that there wasn't enough (or in some cases any) scientific research of bisphosphonates' action against those conditions in young horse or racing populations. So why are people taking the risk? McLellan thinks it comes down to a misunderstanding on the part of practitioners and horsemen. “I think the vets that are using it at the track believe that they're helping, just because they haven't really read up on the science,” he said. “The simplistic approach is 'it stops remodeling so that must be a good thing.' I think they think it's a good idea, they're just not aware enough of the possible side effects. The other reason practitioners may reach for a bisphosphonate is its potential for analgesia. For older horses dealing with navicular syndrome, that can keep them comfortable while shoeing or other therapies go to work. The issue with long-term analgesia for a horse with a different problem who's also in high-intensity work is it's difficult to tell whether their condition has actually improved with time. McLellan says in his practice, he has seen a number of sesamoid injuries which have been traced back to preexisting damage the horse did not appear to be suffering from. Could this be because their pain has been relieved with bisphosphonates, allowing them to keep training? He's not sure. There's another area McLellan is concerned about: that warning on the drugs' labeling about pregnancy and how that may be impacted by off-label use. Where are the drug companies on this? Perhaps surprisingly, technical veterinarians from Dechra Pharmaceuticals, which produces Osphos, say they're just as worried as regulators about misuse of bisphosphonates. “Dr. Bramlage said he wished people had never used these drugs in racehorses. We do, too,” said Dr. Joe Manning, a former practicing veterinarian who now sells Osphos for Dechra. Manning and other Dechra representatives said they were aware of the potential for misuse from the first approval of Osphos in 2014 and have directed more resources than ever at client education, pushing hard for veterinarians to limit use to horses four years old and upwards. 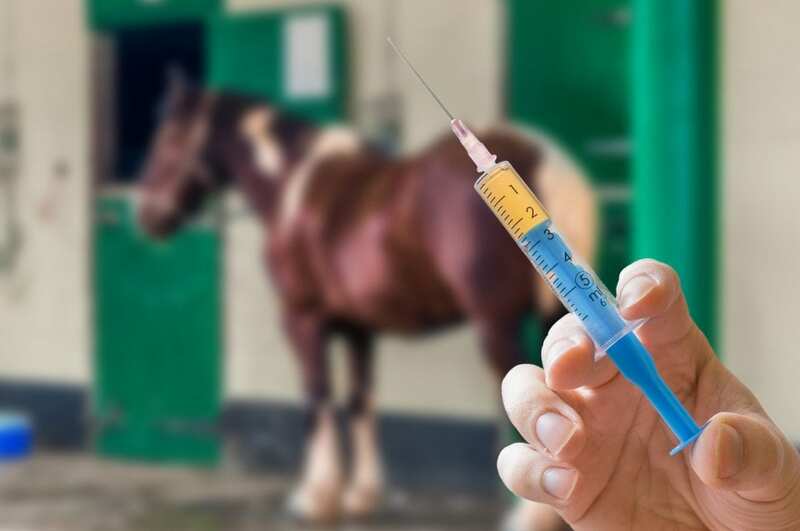 He's also telling veterinarians not to use it in horses with known fractures, and to re-dose horses per the label's instructions, which suggest a minimum of three to six months between injections. Any redosing should be based on the horse's symptoms, not the date of their last dose. Dechra enthusiastically supports bans on the drug's off-label use in young horses, including one by the British Horseracing Authority which prohibits its use within 30 days of a race or in horses younger than three and a half years old. If horses under that age have been treated with the drug for therapeutic reasons, that horse is ineligible to race during its lifetime. McLellan wants to see veterinarians take bisphosphonates out of trainers' hands, but he admits it's a challenging problem. There are a number of channels a lay person can use to get their hands on a prescription substance, and it's not as easy for Dechra to track as one may imagine. The company sells all its product through outside distributors, which might then fill orders from vets who can sell it either online or off trucks at a profit. When they can trace misdirected product to a distributor, Dechra representatives say they shut down that distributor relationship. Both Conway and Manning agree they also want people calling that number (866-683-0660) so they can stop the practice if they see Osphos being used off-label in a young horse or it is being sold to non-veterinarians. The veterinarians say they're worried this backlash could result in restrictions on the drug's sale – and that's not a good thing for the older horses it was approved to treat. There's another villain on the horizon for bisphosphonate producers: off-label use of a more powerful human bisphosphonate drug that's not approved in horses. Manning said he's aware of a nitrogenous bisphosphonate made for human use that's 20,000 times more powerful than either Osphos or Tildren — and he's seen it sold to veterinarians for $58 a bottle. Although Dechra is unaffiliated with that product, he's aware its misuse in horses could make people even more skittish about the whole class of bisphosphonates. Dechra wants to learn more about how best to test for bisphosphonates, how long first generation drugs remain in a horse's system, and whether they can impact soundness. The company has already funded several studies seeking a better test for the drugs. Currently, they can be detected 28 days out in blood, but researchers are working to find them in post-mortem bone samples – so far, those haven't yielded many answers. The company is funding additional ongoing projects, and McLellan is aware of a few researchers with study designs who will soon begin the search for funding. Thoroughbred owner Vinnie Viola committed $500,000 toward bisphosphonate research last week. Manning worries the fact-finding process could be slow because the drugs are still so comparatively new that many universities don't have the proper equipment to design those experiments yet. McLellan warns we are just at the beginning stages of learning about the drug's action in young horses, and until we know more, it's best to remember the veterinary oath: “Do no harm.” In this case, that means adhering to the label. This entry was posted in NL Article, Ray's Paddock and tagged bisphosphonates, dechra, dr. j.d. conway, dr. joe manning, dr. jonathan mclellan, Dr. Larry Bramlage, drugs in racing, Horse Racing, osphos, tildren by Natalie Voss. Bookmark the permalink.